Reverso Varios retratos de un oso panda. Varios retratos de un oso panda. 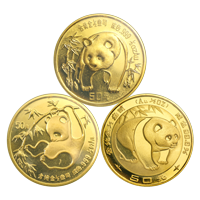 Moneda de oro Panda Chino de año aleatorio de 1/2 onza Obtain your 1/2 oz random year Chinese Panda gold coin online today! The dynamic Chinese panda series is an ever-evolving coin featuring a playful panda in a different pose often involving the spirited animal interacting with bamboo as its reverse. The obverse of the coin includes the hall of abundant harvests 'Hall of Prayer for Abundant Harvests', Located in the 'Chinese Temple of Heaven' and it's year of issue. Stack your wealth in ounces with this highly sought after coin series today!